Get the latest 4barsrest news as an RSS feed. It depends who you ask. RSS stands for either "Rich Site Summary" or "Really Simple Syndication." It doesn't matter however because RSS is a just another way to make content available over the internet. RSS feeds are [for the geeks] simple XML files providing limited information such as news headlines, latest products etc. Using them [see below] takes the hassle out of visiting websites to see their latest additions, be it news, products, articles or reviews. 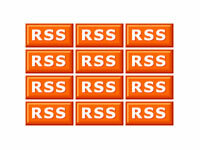 4barsrest currently is providing RSS feeds for latest news. Many websites now provide RSS feeds including the BBC, Guardian, New York Times and ABC Australia. First thing you need is something called a news reader [or an RSS capable browser like Firefox, Opera or Safari]. There are many different versions of news readers [see below]. Once you've obtained a news reader, you can subscribe to the feed in various ways, including by dragging the URL of the RSS feed into your News Reader or by cutting and pasting the same URL into a new feed in your News Reader. Click the orange RSS button and your browser typically goes to a page of wierd code [XML]. This isn't an error. You just need to copy the web address of that page into your news reader. The news reader software will then automatically retrieve and display that site's latest information.